Kettering Town took another giant step towards an Evo-Stik South League Premier play-off place as they gained some revenge on Royston Town with a 4-1 success at Latimer Park. But the Poppies had to do things the hard way as they fell behind inside the first two minutes when Adam Murray intercepted Gary Mulligan’s attempt to head back to Paul White and poked the ball home. Royston went on to dominate the early stages and they could have been further in front with Scott Bridges hitting the post before White made a fine save to deny Rowdell Gordon. Kettering grew into the game but it wasn’t until early in the second half that they levelled things up when Brett Solkhon headed home from a corner. Royston were reduced to 10 men when Sam Corcoran was shown a straight red card for a high challenge on Michael Richens. And the Poppies took full advantage. Mathew Stevens put them in front from close-range and then Aaron O’Connor made it 3-1 when he headed home from a tight angle. 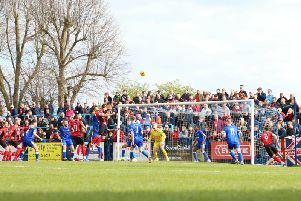 The Poppies saw things out well from there and they wrapped things up late on when Lindon Meikle drilled a 20-yard shot into the bottom corner. The win means Marcus Law’s team are now 14 points clear of Chesham United, who sit immediately outside the play-off places. The Poppies are back on home soil on Saturday when they entertain Frome Town.